Today I want to talk about the cautious and sometimes nimble way that walks with Ruby need to be navigated - what I like to call "Defensive Dog Walking." As Ruby is not my first reactive dog, and we have now been together for six months, I don't spend a lot of time any more feeling sorry for myself or dwelling on the past. The most important thing for me is to keep Ruby safe and comfortable, and I've adapted our lifestyle as much as possible to make that happen. People with relaxed, well-socialized, confident dogs (like the ones that sometimes run toward us off-leash with the shouted assurance that "it's okay, he's friendly!") may not understand the adjustments we have to make on a day-to-day basis, but I can guarantee that everyone with a reactive dog can. For us, this is the new normal. My walks with Ruby recently have been fairly uneventful, since the majority of them are in the dark, cold winter evenings when we don't encounter many others. Some of these walks consist of tromping through the snow together in my snow boots, letting her follow the rabbit trails that criss-cross the lawns. As the warmth and light return, we will have to step up our game, lace up the running shoes, and tackle the triggers with lots of treats and counter-conditioning. Despite often being overwhelmed and overstimulated by the outside world, Ruby is always excited to go for a walk. She bites the toes of my shoes and pulls the laces out of my hands. She knows to wait behind me as we exit my patio gate - I do a quick scan of the parking lot to make sure it's all clear. Lately we've been staying primarily within my town-home complex, which allows us to wander through the buildings without the traffic of major streets. There are several playgrounds where we sometimes stop to practice "over," "under" or "paws up" on the slides and jungle gyms. We have a nice neighborhood for walking to the west, but it requires a busy street crossing where there is invariably a noisy bus or motorcycle passing by or a jogger in the crosswalk. There is also a beautiful open space park to the south, but it adjoins a bike path and a mountain bike course. Bikes are one of Ruby's worse triggers, along with skateboards. At least with skateboards we can hear the wheels clattering from a quarter-mile away and make an escape. With the wheeled nemeses and with dogs, we are still at the stage where avoidance is the best policy. We practice emergency U-turns and creative re-routing. If we find ourselves in close quarters in a pinch, I've discovered that picking her up can help diffuse the situation, and I'm lucky she's small enough that I have this option. As for people, we have started to make some great progress as long as they are moving at a normal walking pace (joggers are another story - Ruby is very sensitive to motion), using the trusty Treat Toob filled with peanut butter and a version of the Look At That game (I say "Who's That?"). I can usually gauge whether Ruby will be okay with someone approaching or whether we need to increase distance. People wearing hats, bulky clothing or carrying something are usually cause for elevated concern. There is also trigger stacking to consider. If Ruby has seen a dog at a distance, and maybe passed two pedestrians without issue, that third pedestrian may be pushing things. There is no such thing as a leisurely walk - I must be scanning the horizon, thinking ahead, watching Ruby's body language and planning for management or escape. They aren't always easy shoes to walk in, but the learning process keeps me on my toes, and most importantly, walking alongside my favorite red-and-white companion. I am so glad you joined the hop because I never even considered trigger stacking before. Though Oz has been doing better with the "Look" command at the start of his threshold, I haven't even taken notice of how he is when we successfully pass one dog only to encounter another. Now I have something else to look for, but that is a good thing. It sounds like poor Ruby is reactive to a lot of things but we know, with time and training, she may be able to overcome some of them with your help! I'm honored to be a part of the group and blog hop - it was such a wonderful idea and I'm grateful to you for putting it together. 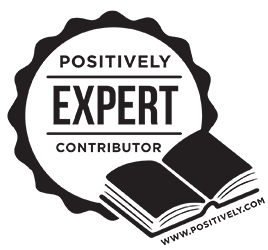 I think it will be an invaluable resource for us all as we learn from each other and share experiences. I feel for you. It's so great that Ruby has you! You are doing such a great job at making sure she is comfortable and not exposing her (intentionally) to more than she can handle. Blueberry is pretty easy going, but I did had a reactive 105 pound foster dog a couple of years ago so I completely understand about avoidance. I used to get up super early and only take her places where I knew the risk of us running into her triggers were minimal. I still, of course, had to constantly be on alert. I'm lucky at least that Ruby is small...if she weighed fifty pounds or more it would be an even bigger challenge. Thanks so much for reading, I am so enjoying getting to know you and Perfect Blueberry! I think you are doing great. Torrey love loves walks. And now that we are lone people in the desert, it's not a problem. Get her around other dogs though, and you never know. You're doing great! It's too bad I missed the hop; I think I need to add a couple of new blogs to my feed reader. Although, Silas, for all his neuroses, is not really a typically "reactive" dog--his only trigger when we're out and about is people reaching for him. I tend to dodge dogs, but that's just because dog-dog interactions are complicated. I'm glad Ruby is making progress! The hop is open through Saturday if you'd still like to join in - you have a lot of valuable information to share! Just recognizing and work with a reactive dog is a challenge, so good on your for that. Steady, slow work will help. I think this group will help too! I'm very excited about this group and blog hop, and thrilled to see how many participated! It's a great resource. Thank you so much for joining our hop and sharing your story. I am already learning so many new things...until today I had no idea what "trigger stacking" was, and how it can play into these situations. I'm more of a morning person, so I often walk Cricket in the early morning when I can, while it is quiet too. That's really hard to do when the temps are sub-zero though. Ruby is such a cutie! Oh, the dreaded trigger stack! 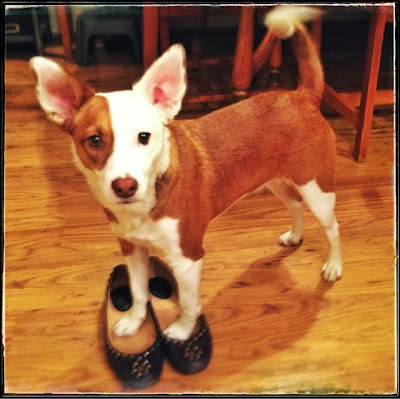 I love the title of this post, the photo, and the description of your walks with Ruby. You have a great attitude, and it sounds like you're giving Ruby everything she needs! Based on some of the comments here, I think I will devote a future post to trigger stacking. It was something that I hadn't really considered before working with Ruby. This was a fun photo - I used getting her paws in my shoes as a clicker-shaping training exercise that evening! What a wonderfully written post. I'm SO glad you mentioned that, despite the anxiety, Ruby loves going for walks! Gets excited even! In our experience, that was the real turning point (perhaps more mentally for me, but who knows) in helping Lucas overcome many of his triggers. Of course, like you said, there's no such thing as a leisurely walk... but if you can have at least a little fun together, that's huge!! It's the little things. I see Ruby's comfort zone around where we live slowly expanding. Kudos to you for rescuing a dog that requires so much commitment. Our Spartacus is mainly leash reactive to other dogs, but I recognize that he becomes uneasy with other things that seem abnormal to him like skateboarders, people with huge backpacks, kids with huge coats, etc. He doesn't go nuts at them but sometimes his hackles raise and that's scary enough with a 60 pound dog. Our main issue is other dogs, and we are working on counter-conditioning. Like you, we have to always be on guard and aware of our surroundings. We are practicing the "Watch me" game so diligently that earlier this week both Sparty and I were both so consumed in eye contact we didn't even notice a dog approaching just a few yards away, and when we did we were able to cross the street without issue. Progress is slow, but these exercises do strengthen the bond and allow our dogs to look to us for guidance around their triggers. 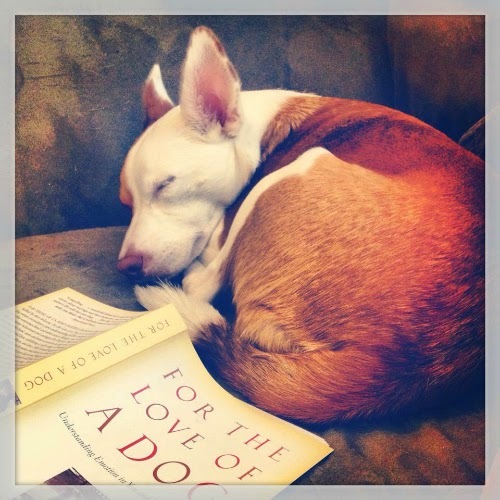 Cute dog and great blog! 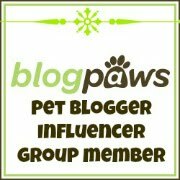 Thank you very much - I have so enjoyed making new connections to fellow dog devotees through this blogging community! Your eye contact progress sounds amazing! Ruby is so easily distracted (a rabbit! a dog! a leaf!) that "watch" is one of our greater challenges. That's an excellent comparison, Anna. With so much time spent around horses, it's not a stretch for me to work with fearful dogs (although you'd never guess she was fearful at /your/ house!). Great post Lara! You've inspired me to try a bit harder with my boy Billy. We have both gotten to the point where going out and about where we may encounter other dogs is just so traumatic for both of us that I've resorted to avoidance. Of course this is a totally valid and often appropriate option, but in the meantime I've given up on working with him. He's actually at the stage where if he sees me putting my shoes on or picking up a leash he immediately becomes really aroused and I can see the adrenalin rushing - before we even get to the front door! Thanks for your comment, Joanna. Baby steps are the way to go, and I think also a level of acceptance that there is not going to necessarily be "a cure" - there will be good days and bad days (we had one of each this weekend, in fact). As dog parents I think the importance of the walk is so ingrained that we feel guilty if we abbreviate or skip, but with reactive dogs that is sometimes the better option! Ruby can take hours to wind down from a particularly chaotic walk, some days we just go for a short sniffabout and burn energy by tugging, fetching and playing indoors. Kathy, I think that is one of the most important aspects of this group and hop. It can be a very isolating feeling when you see people out and about with their seemingly "normal" dogs - now that I have Ruby I find that I see just as many people ducking the other way with their dogs! It's a very common issue. What kind of dog is Charlie Brown? I really love the phrase "creative rerouting", so much nicer sounding than my "a+ ninja avoidance skillz"